Lauren Gerard Koch and Steve L. Britton are new members of the VPR project. Both have primary appointments in the Department of Anesthesiology here at University of Michigan. As a long-term effort they have been investigating the association between low exercise capacity and all-cause morbidity and mortality that is statistically strong yet mechanistically unresolved. By connecting clinical observation with a theoretical base, they developed a working hypothesis that: variation in capacity for energy transfer is the central mechanistic determinant between disease and health (energy transfer hypothesis). As an unbiased test of this hypothesis, they show that two-way artificial selective breeding of rats for low and high intrinsic treadmill running exercise capacity also produces rats that differ for numerous disease risks, including the metabolic syndrome, premature aging, reduced longevity, fatty liver disease, obesity, and Alzheimer’s degeneration. The two-way selection started in 1996, is currently at 36 generations, and the low capacity runner (LCR) and high capacity runner rats differ by over 9-fold for running capacity. With Charles F. Burant (Internal Medicine, University of Michigan) as the senior investigator, and in collaboration with the University of Wisconsin, metabolism and fuel utilization were evaluated in rats from generation 31 of selection. Their recent study demonstrated that during exercise the HCR have greater fatty acid oxidation, show lower mitochondrial protein acetylation, and have delayed accumulation of metabolic intermediates. These results support the notion that mitochondrial efficiency may underlie the health benefits and longevity of higher VO2max. 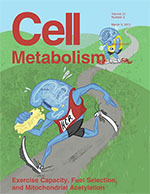 The work was publish as cover feature in the March, 2015, volume of Cell Metabolism. Image created by Maggie Burant mburant@pnca.edu).